It uniquely combines the sensitivity and performance of the “no-edge” technology to the comfort, precision and volume adaptability of lace-up models. This particular construction method allows for the perfect adaptation to different types of rock deriving from the larger surface area in contact with the holds, while comfort is guaranteed by the lacing system that allows for perfect regulation of inner volumes and wraps the foot snugly and precisely, providing even greater support. 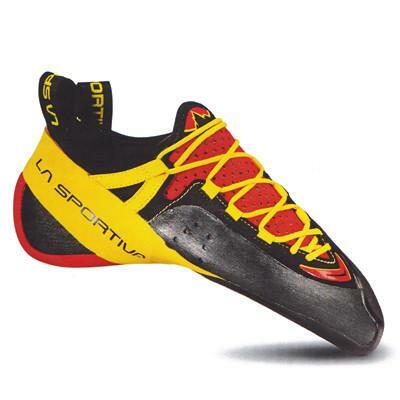 The Laspoflex midsole combined to the P3 Patent System in fact, provides support for the climber even if the shoe is not worn excessively tightly. This construction feature united to the lacing system makes the shoe adaptable to all types of foot, both narrow and wide fit. 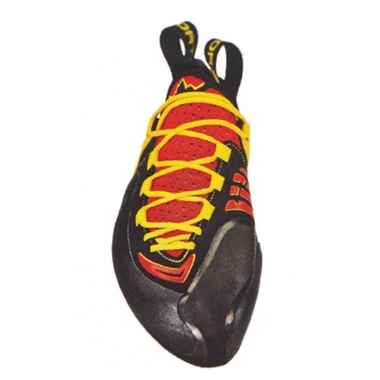 It is the ideal choice for use on rock walls, it can be worn for long periods thanks to the enhanced comfort features but it is also ideal for use on the boulders thanks to the grippy heel. Genius is the natural evolution of the climbing species. Upper: Suede leather combined with microfiber. Slip lasted. Midsole: Laspoflex 1,1 combined to P3 System. Sole: Vibram® XSGrip2 – 3 mm.